‘Move Live on Tour’: Denver, CO (07/15/2014) – Miscellaneous Photos, Fan Tweets, Photos, and Videos! 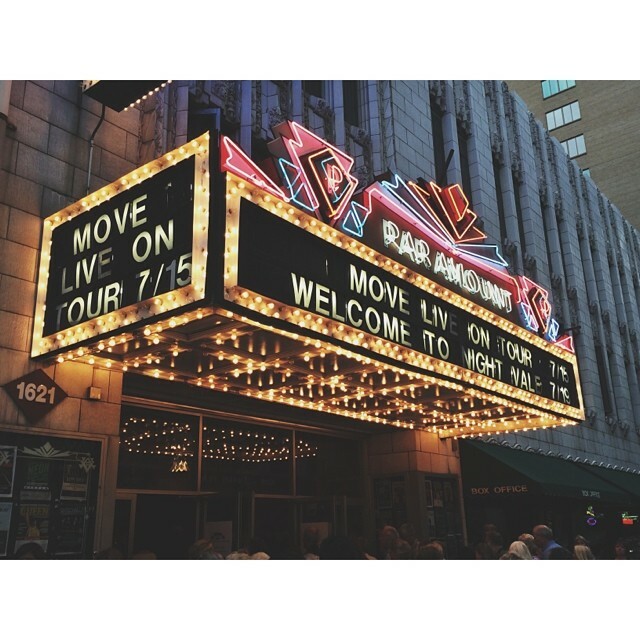 ‘Move Live on Tour’ played a SOLD OUT show at the Paramount Theater in Denver, Colorado, on July 15th! Unfortunately, Derek was still feeling the pain from the injury he got at the end of the Grand Forks show and we found out that he had hurt his back. =( Derek also shared a video on Instagram of him getting treatments, including psoas and dry needling. Looks painful, but I guess it worked for him because he said that he “felt like a new man”! I hope that Derek truly is healing and not dancing in pain. Good thing the tour ends in 10 days! Check out the fun miscellaneous photos below! There is also a video and photos from Julianne and Derek’s visit to the Cincinnati Children’s Hospital. Oh yeah, NBA basketball player Jimmer Fredette and his wife Whitney also attended the concert! Check out this great review of the Denver show from John DiTirro for The Examiner! Great photos also! Check out these photos & a video of Derek and Julianne at the Cincinnati Children’s Hospital courtesy of the Ryan Seacrest Foundation. Check out all of the great comments/tweets, fan photos, and videos from the fans who attended the Denver show! ‘MOVE Live on Tour’ Day Off in Chicago (07/07/2014)! 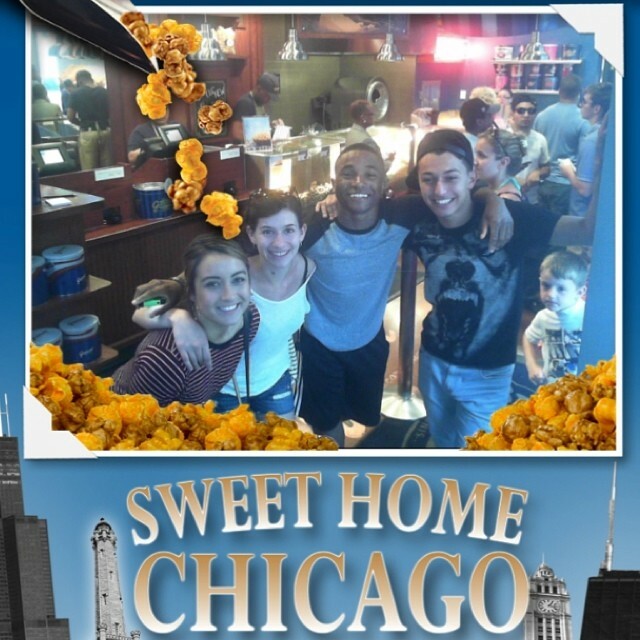 Our ‘Move Live on Tour’ cast & crew enjoyed a day off on July 7 and spent it in Chicago, Illinois! They are playing a SOLD OUT show in nearby South Bend, Indiana, tomorrow night at the Morris Performing Arts Center. As you can see, the dancers and Julianne’s personal assistant, Kristy Sowin, visited famous landmarks, such as The Bean at the Millennium Park. Check out the fun photos below…. also check out Derek and the Sprinkles Cupcakes ATM!! Isn’t that awesome… RED VELVET cupcake please!!! Hahahaha! check out The #CerealAndMilk. Bonus points if you can do it with a bowl of Raisin Bran in hand. PARADE MAGAZINE also did a recent interview with Derek who discusses the tour, his new book, DWTS, and other fun stuff. Read an excerpt below! Right now you’re on tour with your sister. What’s your favorite thing about performing in front of a live audience? Between DWTS, the Move Live tour, and your other projects you seem to be constantly busy. What do you do in your down time? Speaking of Derek’s book… He has finally started promoting it on twitter! 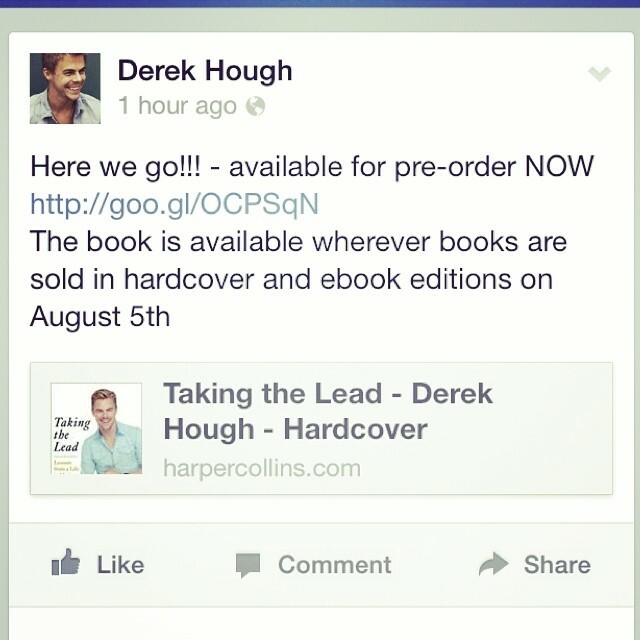 His book, Taking the Lead: Lessons From A Life In Motion will be released on August 5, 2014, and Derek will be promoting the book on a national book tour. Check out the details at PureDerekHough. You can pre-order the book here and on Amazon! Now, for the first time ever, Derek opens up about his life and the lessons he’s learned on and off the dance floor, revealing how he went from bullied boy to ballroom boss. He details how his experiences have taught him to embrace a positive outlook, and shares the insights he’s gained working with celebrity partners, along with never-before-told, behind-the-scenes stories from the show. Throughout, Derek spills the real secrets of learning to dance—connection, respect, and cooperative commitment—and demonstrates how he draws on the lessons of dance and competition to embrace and overcome the daily challenges we all face. 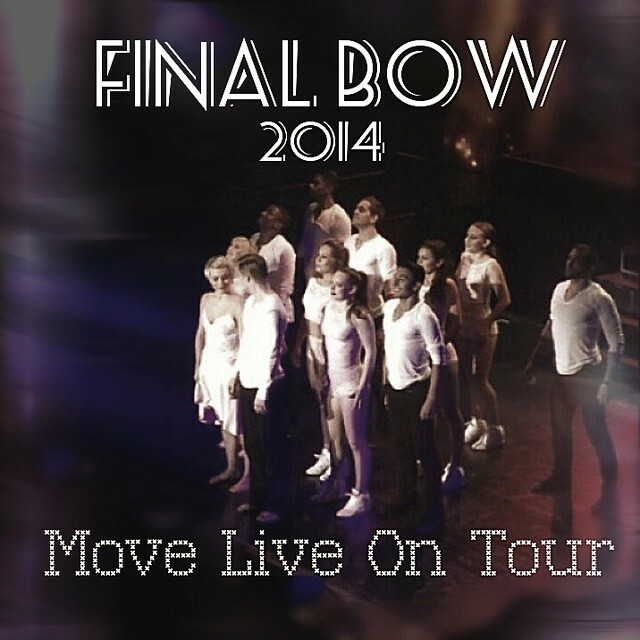 ‘Move Live on Tour’: Windsor, ON, Canada (07/05/2014) – Miscellaneous Photos, Fan Tweets, Photos, and Videos! 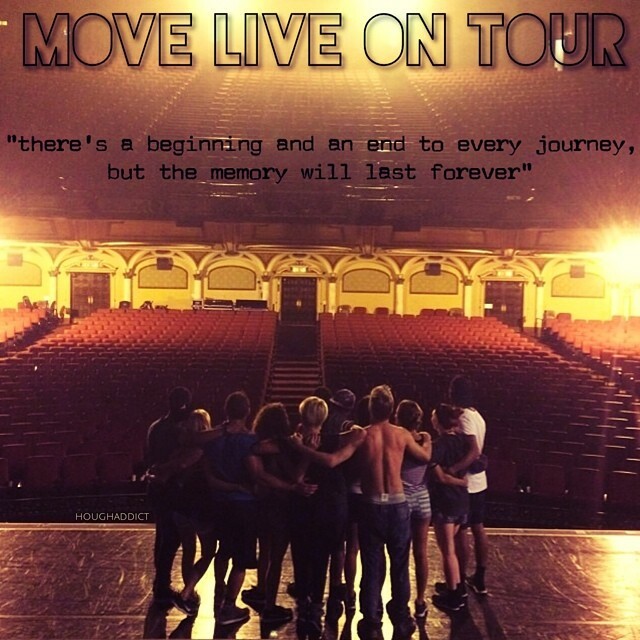 ‘Move Live on Tour’ performed a second show in Ontario, Canada, at Caesars Hotel and Casino in Windsor on July 5th! Found out on twitter that Derek and Julianne’s dad (Bruce Hough) and their step-mom was there, as well as, Julianne’s boyfriend Brooks Laich. Check out all the fun miscellaneous photos from the cast and crew, as well as, a fun video from Julianne’s website and an interview with Derek from HLN! The Spice Girls are touring with ‘Move Live on Tour’ now! LOL! Check out the video on Julianne’s website here! Derek interview with HLN’s Weekend Express. He talks about ‘Move Live on Tour’, his childhood, and dancing with Amy Purdy! Watch the video here! Julianne dancing with her dad, Bruce Hough, while Derek films them! ‘Move Live on Tour’: Orillia, ON, Canada (07/04/2014) – Miscellaneous Photos, Fan Tweets, Photos, and Videos! Happy 4th of July! Today, the ‘Move Live on Tour’ cast & crew spent the American holiday in CANADA! This is their first out of country show date and they played the Casino Rama Entertainment Center to another sold out crowd! Check out these fun miscellaneous photos from the dancers and fans! Derek also appeared on ‘The Better Show’, which is a local New York morning show, for an interview! 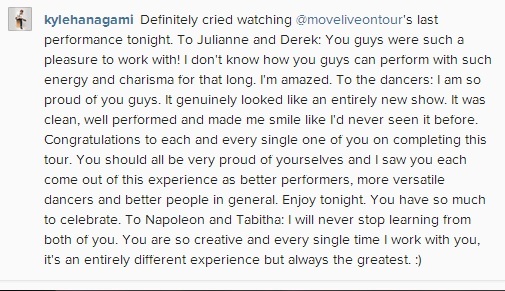 He speaks about ‘Move Live on Tour’, his involvement with Kelloggs, and DWTS. Check out all the videos here! Here are some HQ photos from the Cincinnati, Ohio, show from the iSPY CINCY Facebook account! Check them out here! We are pretty much at the halfway point of ‘Move Live on Tour’ and the cast & crew had a day off on June 30 prior to their show at The Palace at Greensburgh, Pennsylvania on July 1. It sounds like one of the crew members organized a BBQ as many of the dancers tweeted photos from it. We also got some great interviews and blogs from Julianne and Derek that you can check out below!! Derek talks to USWeekly about how grueling ‘Move Live on Tour’ has been, but also adds it’s insanely fun! 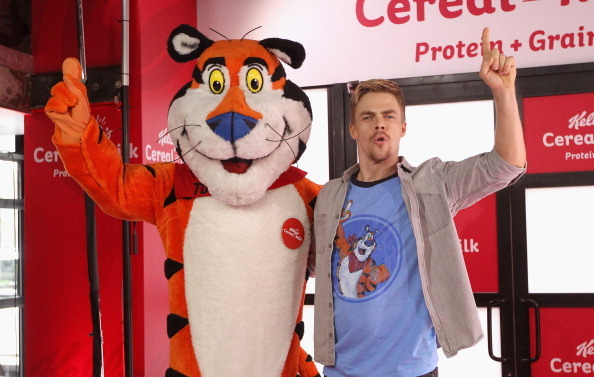 He’s interviewed at the Kelloggs event he did last week in NYC. Make sure you check out the fun video at the article also! Please make sure you read this AMAZING interview that Derek did with Today’s Woman Now where he discusses his gratitude for his success and fans over the years, as well as, new details about ‘Move Live on Tour’…. like it could have just been based at The Venetian Hotel in Las Vegas! Below is an excerpt from the interview. He muses: “There’s a science to success I feel. (You) can follow certain people in their footsteps…follow certain paths. There is a certain science to it. Whereas fulfillment is an art. And I really feel like the fulfillment element of it wasn’t there (at DWTS) for me for a while, he continues. “And then all of a sudden I changed my perspective. And certainly, with Sochi paralympian bronze medalist Amy Purdy (with whom Hough came in runner up on DWTS’s very recent season 18) it was truly incredible to have that experience. Having Amy as my partner transcended the whole competition aspect of the show,” Hough declares. Julianne is also the cover girl for the August issue of Redbook magazine! Check out Eonline’s article of Julianne’s cover and some beautiful photos! 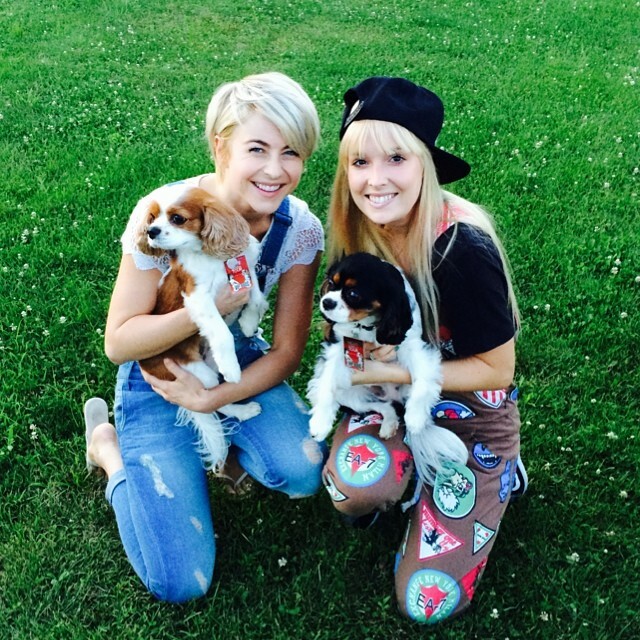 Lastly, here are some fun photos and interviews from the BBQ! And here are some fun videos from HoughAddict on Instagram! ‘Move Live on Tour’: Red Bank, NJ (06/24/2014) – Miscellaneous Photos, Fan Tweets, Photos, and Videos! 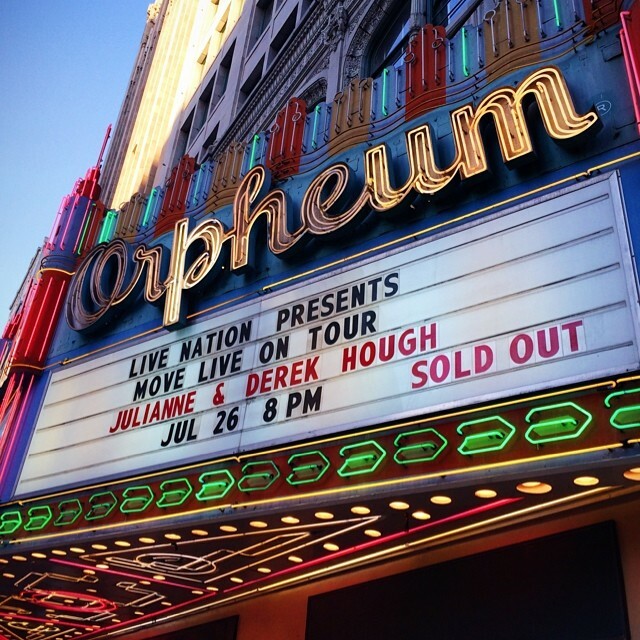 Another SOLD OUT show for ‘Move Live on Tour’ at the Count Basie Theatre in Red Bank, New Jersey, on June 24 2014! But first the cast & crew enjoyed a much needed day off yesterday. It sounds like the Move Dancers relaxed in NJ, while Julianne celebrated her boyfriend’s (Brooks Laich) birthday, and Derek did some sightseeing in NYC (including the 9-11 Memorial). We also found out that NappyTabs is working on a mystery project for Broadyway! Congratulations to Napoleon and Tabitha! But another reason that Derek was in NYC was because he has a surprise guest appearance on The View this morning! Check out photos and video at PureDerekHough! Check out this review from Robert Johnson at NJ.com who went to the NYC Broadway show…. Don’t agree with some of it though! Check out these great miscellaneous photos and videos from the cast & crew, as well as, the fans … Then check out all the great tweets, photos, and videos from the fans tonight at Count Basie Theatre! Jake dancing in a bear costume! Whos dancing bear is this?? !